Jerry Seinfeld, Learning to Bee on the Big Screen Jerry Seinfeld last sat down with Fresh Air in September 1987, before his TV series made him an international celebrity. Now he's back, and in a big way: Bee Movie, the animated comedy he's written and produced for DreamWorks, opens this Friday. He talks to Fresh Air guest host Dave Davies about the project. 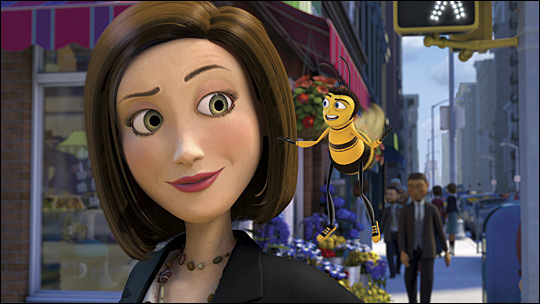 Jerry Seinfeld is the voice of a young, idealistic honey bee in his new animated feature, Bee Movie. Classmates Adam Flayman (Matthew Broderick, left) and Barry B. Benson (Jerry Seinfeld) tour Honex, a division of Honesco. 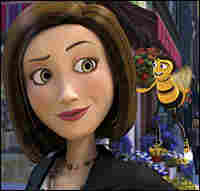 Barry B. Benson breaks the cardinal rule of being a bee — don't talk to humans — and befriends Vanessa (Renee Zellweger), a New York florist. Barry B. Benson (Jerry Seinfeld, right) and Mooseblood the mosquito (Chris Rock) encounter the big-city hazard of windshield washer fluid. Seinfeld says much of Rock's character was ad-libbed. 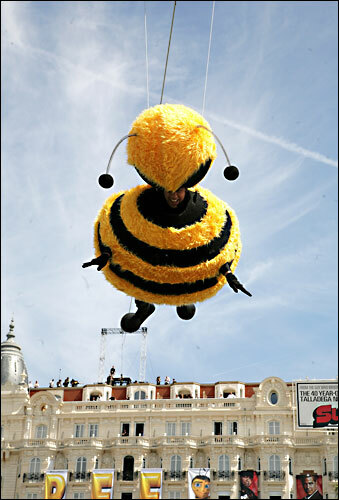 Jerry Seinfeld "flies" from the top of the Carlton Hotel in Cannes, France, in a bee suit to promote Bee Movie at the Cannes Film Festival in May. Almost a decade after filming the last episode of the Emmy award-winning sitcom Seinfeld, comedian Jerry Seinfeld returns to the screen in a new animated feature, Bee Movie. Seinfeld voices the character of Barry B. Benson, a young bee who longs to experience life outside the hive. Seinfeld spoke to Renee Montagne about honey bees, comedy and his transition to animation. 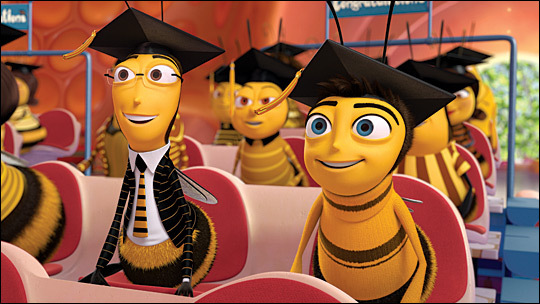 Barry B. Benson is a young college graduate who feels limited by his sole job prospect: becoming a worker bee at Honex in New Hive City. "It's a very vibrant, cosmopolitan environment," Seinfeld says of the hive. "The only downside is they only have one industry...They don't really do anything other than make honey.'" Seinfeld says it took a long time to design the way the bees look in the film; from the way Barry's face mirrored his own, to the bees' wardrobe. "I like the idea that they are very into fashion," Seinfeld says, "but only in the black and yellow palette — and no pants." After nine years, 180 episodes, and 90 hours of air time, Seinfeld says he had his fill of live-action filming. Switching to animation, he admits, was a welcome change of pace. "This was like a whole new sandbox," Seinfeld says, "with different technology and different toys, and having no restrictions visually or cinematically." Still, the building blocks remained the same. 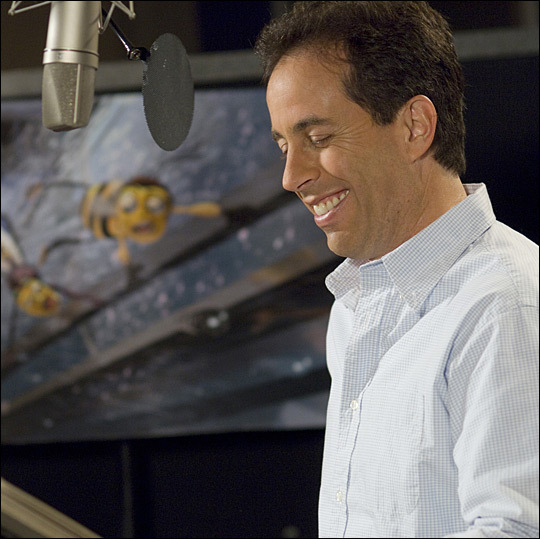 Though Bee Movie is an animated feature, Seinfeld acted out the entire script to help animators craft the bees' gestures and facial expressions. "Whether it was my line or somebody else's line," Seinfeld says, "I would get up in front of them and act the whole thing out." Seinfeld says it was often a tedious, detail-oriented process. He would ask animators "to do it over, and over, and over" until the gestures were just right. "I don't know exactly what [the animators] do," Seinfeld says, "but I know it takes them forever until they've done it. Instead of having the eyebrows go down, have them go up — you wait like four days for that." Despite the meticulous animation process, there were plenty of moments of spontaneity in the making of the film. 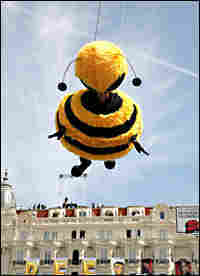 Seinfeld estimates that 10 percent to 20 percent of Bee Movie's dialogue was made up "on the fly." 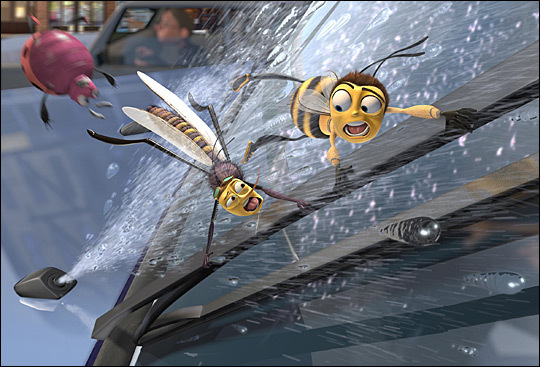 One example is Barry B. Benson's run-in with a mosquito — voiced by comedian Chris Rock — on a truck windshield. "I had just called [Rock] the night before..." Seinfeld says. "He came into the studio and we just made up this character... I just interviewed him as the mosquito and all of his answers are in the movie... We were just fooling around." Seinfeld says he often asked the actors to record their lines without the script. "That's another great thing about animation," he says, "is you can do the scene innumerable times, whereas in film, you're lucky to get two or three takes." I think the idea of a comedian is someone that you relate to. I think "comedy star" is almost an oxymoron. You don't look up to comedians like you look at Madonna, or Elvis, or people like that. Twenty years later, how does Seinfeld stay grounded now that he's a "comedy star"? "At this point, my life is very similar to what it was," Seinfeld says. "I'm in the same neighborhood. I go by the bus stop where I used to wait to take the cross-town bus to go to the East Side and perform ... I think that helps me in some way just remember that it's all the same thing. What did Lenny Bruce used to say? 'We're all just another schmuck.'"